Anton Hopen reports that GM won an important verdict in a trademark case involving a toy Hummer. The jury awarded over a million and a half dollars for the infringement of GM’s trademark on the distinctive grille design of the Hummer. What are the two questions? One is whether toy manufacturers are infringing trademarks when they make toy models of trademark-protected vehicles (and presumably aircraft and the like). Now, most automobile designs are not necessarily trademarks — being product configurations, fundamentally — and probably none are registered. 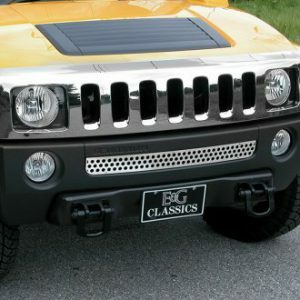 But the grille design evidently was ruled not to be functional but to be a trademark feature used as a source indicator for Hummers and which has secondary meaning. Hopen doesn’t say much — the opinion is reported, however, at 80 USPQ2d 1608, if you want to know more; I can’t give it all away, and besides guessing is allowed in blogs, if not in my day job — but this sounds like it was probably a dilution claim, unless GM argued that it was likely to move into toy sales, which sounds like a stretch. And the second thing we learn? Plaintiffs that are rich enough, protecting trademarks that are valuable enough, will proceed to trial and final judgment and will get awarded actual money damages in trademark cases. I’m curious: if the grille design constitutes a trademark that says “Hummer” to the buyer, is Hummer required to continue using that design (or something close to it) or risk losing the mark? I guess I’m sort of looking at dilution in the other direction: if customers start expecting that any old design MIGHT be a Hummer, then the trademarked design loses some power as a distinctive mark. Actually, many automobile designs are registered. Grilles, as featured in this case, are the most common parts of auto designs to be registered. The Hummer grille itself (reg 1959544) was involved in a lawsuit by Jeep (regs 117088 and 1433760, among others) – apparently AM General, who originally designed the Hummer, was affiliated with Jeep when the design was made, but was later spun off. Among many other registered grilles are Rolls-Royce (1063799), BMW (1415749), Dodge trucks (2593670 and many others), Buggatti (2956069), Bentley (1512167), and Mercedes (1130721). Other parts of car designs can be registered, and are – registrations 3052329 through 3052331 cover the tail lights, roof line and side scoops of a Ford Mustang, respectively. Mike, I meant the design of “an automobile,” i.e., the “look” of a whole car. Martin, you can defend a claim of trademark infringement by claiming abandonment, but abandonment isn’t too easy to show. Take a look at your favorite food product, such as a box of cold cereal box, some time. You will see in some cases a whole little gallery of trademarks on the box that are mainly being utilized there to forestall an abandonment argument. The companies involved are not interested in those marks for their present marketing concepts, but they’re probably worth millions, so they keep them alive this way. Even absent this sort of brand maintenance, though, abandonment usually requires either an affirmative statement of abandonment — quite rare — or a pretty long period of non-use, sometimes years, before a court will infer abandonment. As to abandonment in a strictly dilution context, what is abandoned as a trademark is of course not amenable to protection from dilution. On the other hand, an interesting question, probably never decided (especially since federal dilution hasn’t been around that long), is whether you can “abandon” or otherwise lose “fame,” once established in an earlier time. Fame is a prerequisite for relief under the federal anti-dilution act (not just any trademark is entitled to protection from dilution). > Mike, I meant the design of â€œan automobile,â€ i.e., the â€œlookâ€ of a whole car. I’d find it hard to argue that VW had no trademark rights in the shape of the VW Beetle. In fact, they’ve registered exactly that – see regs. 2409675, 3038741, 3113375 or 3187600. They also registered a picture of an old-style beetle for other goods in reg. 3043073, and a stylized version of the beetle shape in several other registrations. Mike, I’m here to bring out the best in you!